I discovered not so long ago that Dawn has a blog: dawntoussaint.blogspot.com. Isn’t Padma looking extremely kawaii!! I LOVE that Dawn has created an elephant. 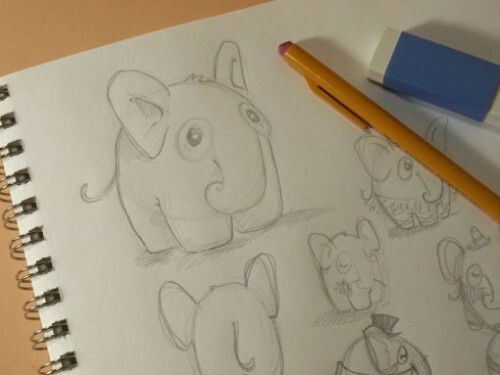 Elephants are my all time favourite, favourite, favourite animal :mrgreen:! Padma’s pattern will be broken up into 4 instalments, posted on Saturday and Wednesday of the next two weeks. All Dawn asks in return is that you give her feedback on the pattern and of course share pictures of your creation. The first instalment was posted Saturday. You can find Dawn’s post on her blog here. 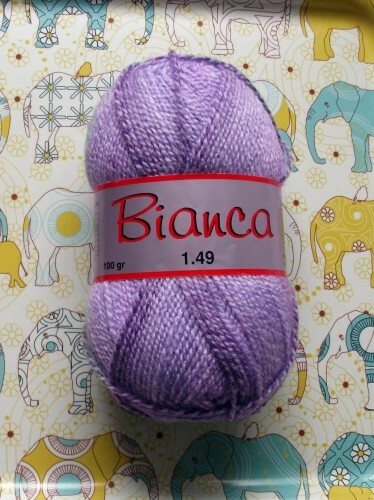 I’ll be using a purple variegated yarn (Bianca colour 70194), bought a while back at Wibra. 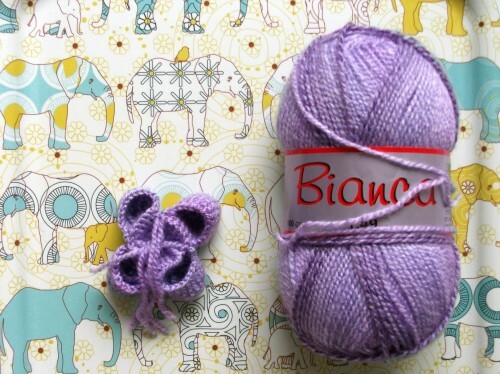 The yarn calls for a hook 3,5-4 mm. I’ll be using a 3,5 mm hook, but I’ll be crocheting loosely. Dawn also made a Ravelry group for this CAL: CAL with Dawn Toussaint. You could ad in the pattern how each leg should be finished. Leave a long tail? How to tie off? It becomes clear once you start the belly that you won’t need to leave a long tail when finishing of the legs, but it would be nice to ad it anyway. As for tying off, I cut my thread and pulled it through the loop on my crochet hook, making a knot to secure the crochet work. I’m assuming this is how it is done, but maybe for beginners it would be nice to ad that part as well. There has been a lot of talk about which side of the crochet is the right side. I’m right-handed, and when crocheting, the right side is facing me (the inside curls to the inside naturally). I’ve read some people prefer to turn the crochet work inside out after they finished, thus making the side that turns away from you when you crochet right-handed the eventual outside. And the way the crochet work curls is also different for right-handed and left-handed people. When you have to attach the legs to your belly, it’s important to know what side will be the inside and what side will be the outside. 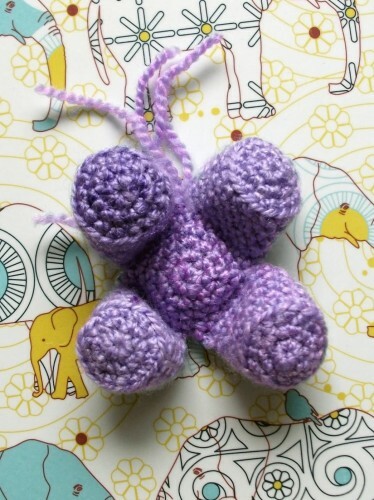 When you crochet right-handed and have the side that’s facing you be the outside, you could ad that when you pick up the legs, you FIRST have to push your hook through a stitch of the leg, then pick up a stitch of the belly, and finish off the single crochet. The pictures you added on your blog are a nice guide, but maybe you could also ad it in wording? I think for left-handed people, this will be the other way around (first go through a stitch of the belly, then pick up a stitch of the leg and finish of the sc)? I’m not sure.